The Evangelical and Reformed Church was the result of a 1934 merger of two historically German-American Protestant churches, the Evangelical Synod of North America and the Reformed Church in the United States. Virtually all of the resulting Evangelical and Reformed churches in North Carolina had been part of the Reformed Church in the United States. The Reformed Church in the United States had its origin among the Pennsylvania Dutch in the early eighteenth century. These people came to America from German-speaking areas of Europe and included Protestant groups from both Lutheran and Reformed traditions. By the end of the century, the Reformed groups felt the need to create a formal, American church organization, founding the Synod of the Reformed (High) German Church in the United States of America in 1793. This tradition came to North Carolina largely through the migration of Pennsylvania Dutch families, beginning in the middle of the eighteenth century, to what are now Catawba, Lincoln, Rowan, Cabarrus, Davidson, Forsyth, Guilford, and Alamance Counties. 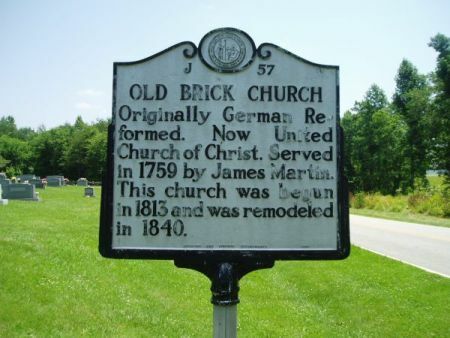 In 1831 members of 16 congregations organized the North Carolina Classis of the German Reformed Church, bringing local governance to the churches that until then had been governed from Pennsylvania. The classis founded Catawba College in Newton in 1851. The college moved to Salisbury in 1925. The Evangelical Synod of North America also traced its origins back to German-speaking immigrants, those immigrating to the Midwest in the middle of the nineteenth century. These people left Germany after the 1817 Evangelical Union in Germany, which had united the Reformed and Lutheran churches into the Evangelical Church. These immigrants formed a number of synods that eventually joined together into the German Evangelical Synod of North America in 1877. Although the Evangelical and Reformed Church was created in 1934, it was not until 1939 that North Carolina churches were fully integrated into the new denomination by the formation of the Southern Synod of the church. The Southern Synod was initially made up of 62 congregations with 11,000 members, mostly in North Carolina. These churches were concentrated in the same areas where the Pennsylvania Dutch had settled almost 200 years earlier, and there are still concentrations of former Reformed churches around Hickory, Lexington, and Burlington. The Evangelical and Reformed Church merged with the Congregational Christian Church in 1957 to form the United Church of Christ. Robert T. Fauth, ed., The Evangelical Synod: One Hundred and Fifty Years, 1840-1990 (1990). Jacob Calvin Leonard, The Southern Synod of the Evangelical and Reformed Church (1940). "Old Brick Church," NC Historical Marker. Originally German Reformed Church. Image courtesy of the North Carolina Office of Archives & History, call #: J-57. Available from http://www.ncmarkers.com/marker_photo.aspx?sf=a&id=J-57 (accessed June 5, 2012). 1 January 2006 | Tiemann, Thomas K.